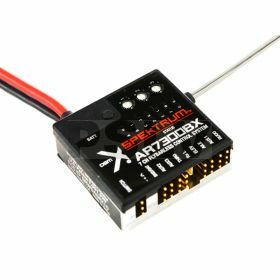 The AR7300BX combines the security of a 7-channel, DSMX® receiver with the precision of a BeastX® flybarless system in a single, compact unit. It's simple to use too. No special programming interface is needed for setup and adjustment. All you need is the DSM2® or DSMX transmitter it's bound to. Complementing this incredible technology is an integrated power bus that eliminates the need for a BEC*. It is designed to handle the demanding current loads of today's high-voltage servos. This makes the AR7300BX a great choice for high powered 550- to 800- size electric helis as well as .50- to .90- size gas/nitro machines. The included switch harness is designed so that, should the switch fail, it will fail in the 'on' position. *The AR7300BX receiver does not regulate voltage output to servos. A USB programmer for making firmware updates is available separately.